On May 22nd, Mars will be at opposition. It’s the astronomical term for when Mars and the Sun are on opposite sides of the Earth. This makes the face of Mars fully illuminated from Earth, and also brings the Earth to it’s closest approach of Mars, at 75 Million Km. 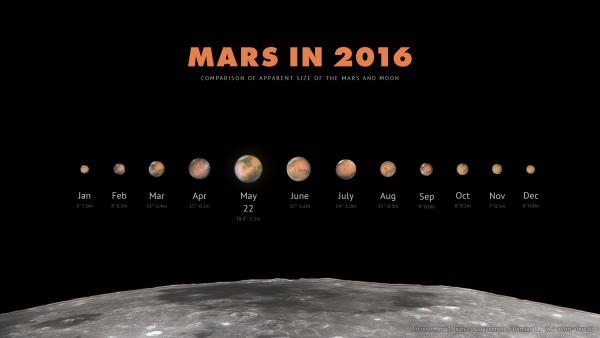 Hubble images the red planet to celebrate the occasion. So get your telescopes out and be ready to take some pictures, because Mars is smiling! Mars will rise in the East at sunset, since they are on opposite sides of the Earth. It will appear bright with a rusty hue, and will not twinkle as much as a typical star. Since planets are closer to the Earth and have a larger angular diameter than a distant star, atmospheric distortion isn’t as strong. For northern observers, you can spot Mars near Saturn in Scorpius, toward the South-East. Be wary, Scorpius has one of the brightest red stars, Antares, which is often confused for Mars. The Moon will join the fray too, washing out dimmer stars but enhancing the busy planetary scene. Mars will be brilliant at magnitude -2, outshining even Saturn, yielding only to Jupiter and the Moon. Happy Planet Hunting! Have a great long weekend (if you’re in Canada).